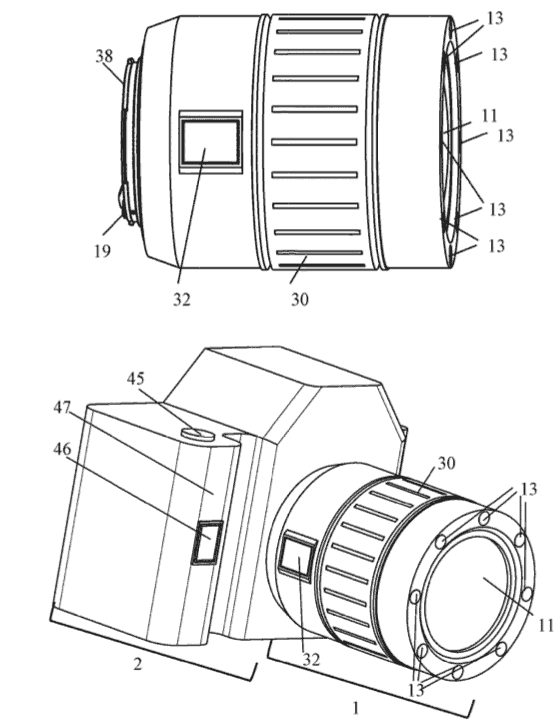 Canon and general camera related rumours /patents/info. Specific camera model info can be found on the rumours index page (along with lenses and printers and other makes). 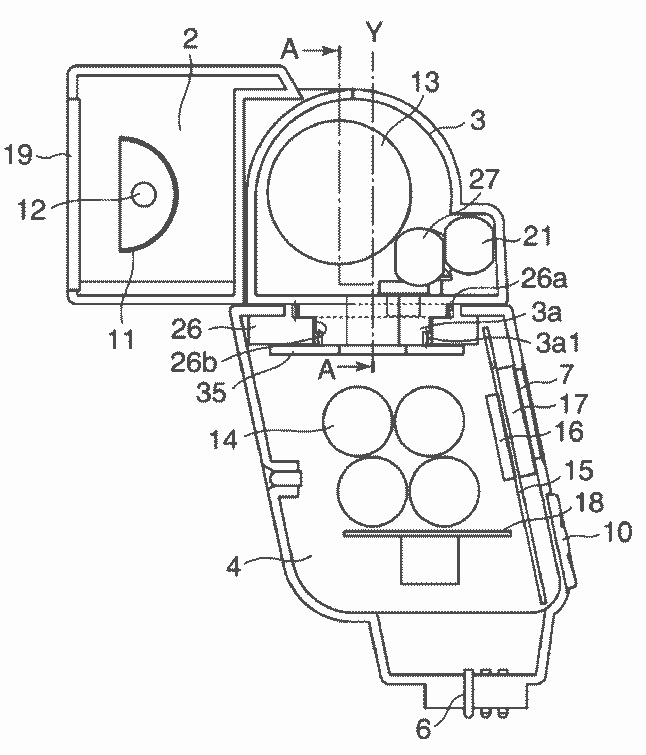 28th A US patent application [USPTO] looks at customising the quick menu on the back of Canon cameras. Move stuff around and change sizes. 25th Happy Christmas to all our readers! Oh, and what will be the naming/numbering scheme for the EOS R range? 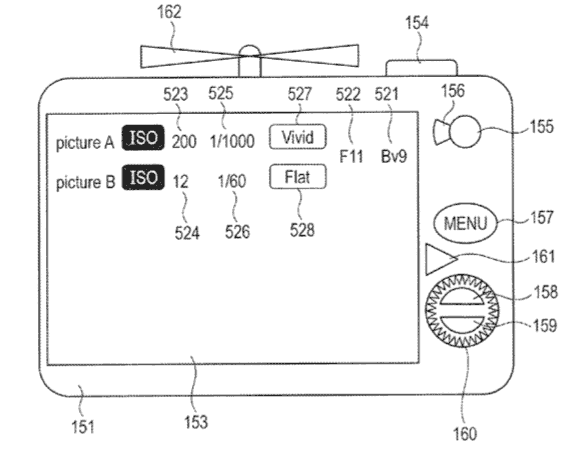 12th A bit of curved sensor technology info [ISW] – covers displays and other curved optical components. 6th Are Sigma having another go at Foveon? 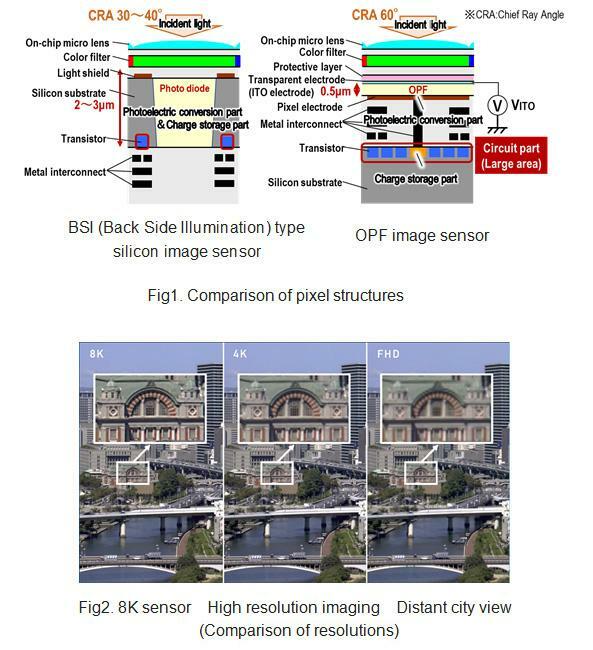 A Japanese patent application [HL] drops the three colours per pixel to two. 5th There’s been a flurry of ‘leaked’ Sony sensor specs of late. Assuming these are for real they show nothing more than Sony is working on better sensors in many different areas. So we move from 2 yearly to 18 months and then annual. 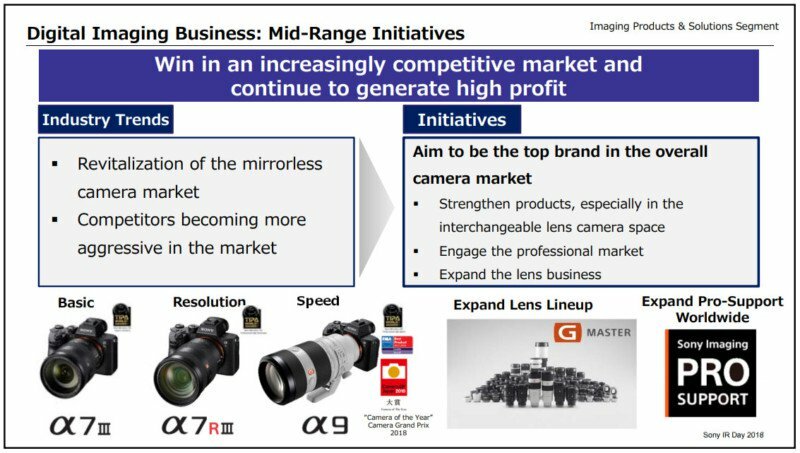 I note some of Thom Hogans more refined analysis [TH] of some of the graphs about full frame camera sales you may have seen. Both 50MP, both roughly the same field of view (unshifted). 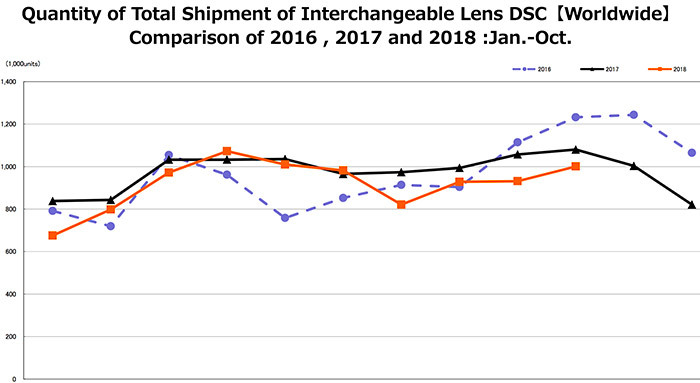 Obviously we’ve seen those new mirrorless cameras, but the decline in overall camera shipments continues. I don’t know the full meanings behind all those figures, so I’ll leave more informed comment to the likes of Thom Hogan. On the subject of those Sony sensors – I’ve a Hasselblad X1D-50C with the 21/4 lens here for a short test – Not the best time of the year weather wise, but hopefully long enough to get a real feel for using it. 20th Whilst 3 DSLR’s are forecast for next year [CR] there’s an interesting suggestion that at least one update has been given the chop in favour of an EOS R model. The 5Ds successor is a natural for this, since if you’re looking at typical 5Ds users (myself included) then if the viewfinder is good enough, it’s the sensor quality that makes the difference. 16th Updated certification data [Nok] points to upcoming cameras from Canon – note that these have full SKU codes so are likely for early next year. What are they? I’d suspect an 80D replacement at least, and maybe an xxxD model. A new EOS R mirrorless is likely too, but maybe not in this info? Body only and two lens kits? 11th The quality of rumours seems to have plummeted now that the Canon and Nikon mirrorless cameras are actually shipping. There’s nothing of any note other than relative clutching at straws by the assorted “We said it first” rumour sites. My suspicion is that they are seeing a real fall-off in visitor numbers after the EOS R and Nikon Z announcements and need to drum up clicks for the forthcoming holiday sales/offers season. Yes, I see the fall-off here too, so it’s why I’m redoubling my efforts on the ‘real’ side of the site (articles/reviews) – more on higher end printers/cameras/lenses to come as and when I can arrange it (we’re simply not not ‘flush’ enough to go for spending thousands of pounds for items just to review). Even the reliability of the good old Canon timeline is now called into doubt, with the disruption of the EOS R and (I’d suggest) even greater disruption of the move to the RF mount. Certification data [Nok] does suggest 3 Canon DSLR’s and one FF mirrorless for 2019, but keep an eye out for updates to that data, since it’s from September. 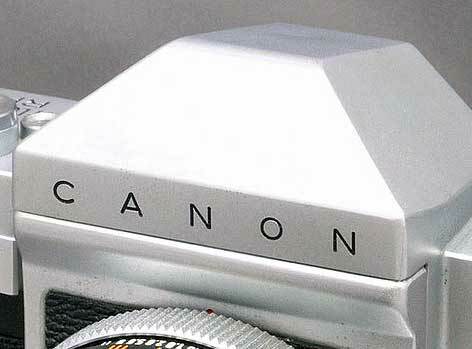 1st Canon are making a range of their sensors available for industrial use. MELVILLE, N.Y., November 1, 2018 – Image sensors are an important driving force behind many of today’s successful brands, ranging from consumer products to industrial solutions. Today, Canon U.S.A, a leader in digital imaging solutions, announces that it is now offering select CMOS (complementary metal-oxide semiconductors) sensor products for sale to the industrial marketplace. Manufacturers, solutions providers and integrators who are searching for advanced components to create their own unique products and solutions can now utilise Canon’s patented technology to help them create these products and solutions and expand their business potential. 35MMFHDXSCA CMOS Sensor – featuring an enormous 19um pixel pitch, the 35MMFHDXSCA CMOS sensor is capable of capturing colour images in exceptionally low-light environments where the naked eye struggles to distinguish objects. Using new pixel and readout circuitry technologies that deliver a 2.76 megapixel resolution, these sensors can support a wide range of applications which require ultra-high sensitivity image capture, including defence, astronomy, surveillance and industrial operations. The Canon 35MMFHDXSCA is now available. 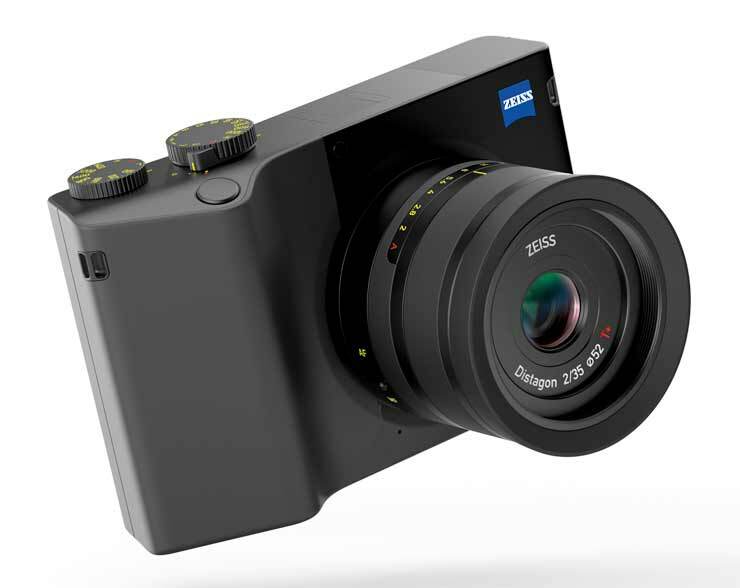 2U250MRXS CMOS Sensor – with a readout speed of 1.25 billion pixels per second, the prototype 2U250MRXS CMOS sensor, delivers ultra-high 250MP resolution in a compact APS-H format. Through advancements in circuit miniaturisation and enhanced signal processing, this sensor delivers high resolution with incredible sensitivity and low noise. 19th So it’s 2000, digital is looking, only to some I recall, the way that photography is going. You get a choice in getting some Kodak or Fujifilm shares – the only two big manufacturers of colour film. How will they compare after a few years? There’s an interesting look at the way the two companies faced the problems [PP] with lots of info I’d not seen before. 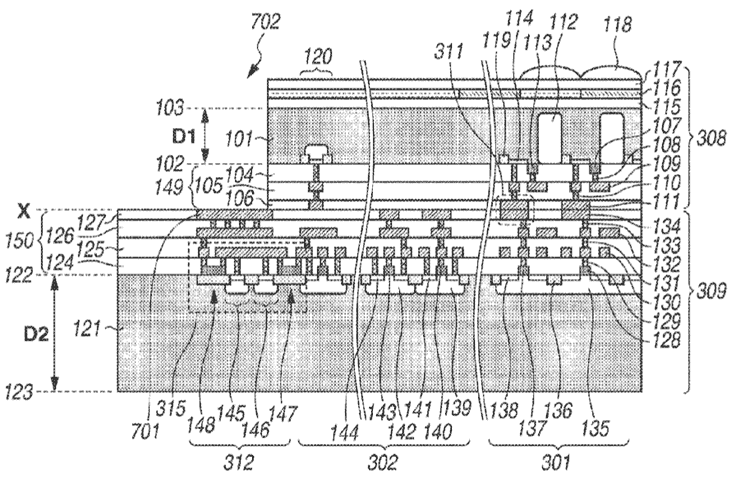 4th Canon is working on stacked image sensors – there have been plenty appearing in patent applications of late. This diagram from a new one [USPTO] shows some of the different ways layers talk to each other. 29th As Photokina winds up, it’s worth looking at what’s been announced and what hasn’t. I’ve only followed announcements in brief, since once again PK coincided with our family holiday – at least next year it’s in the spring and becomes annual. The ‘2019’ Panasonic Lumix S1R [DPR] looks to be a genuinely interesting development, even if the products and lenses are mostly in the ‘jam tomorrow’ category. It’s rather nice – even if 24mm would be my choice for a fixed focus lens. 27th Today marks 15 years of having pages with rumour information on the Northlight site. The first item was actually the Epson SP4000 printer, where the announcement was published in September 2003, a week or two early in a (print) magazine. Not knowing how long it would run for, early rumours were rather disorganised on the site – a lot was tidied up in 2015 when I completely re-wrote the site. Camera rumours started in earnest with the 1Ds mk2 in June 2004. If you’re curious, there are links to all I could find during the re-write on the main rumour page (click on the archive tab). You might note that rumours were more plentiful, but no more accurate. In September 2004, as now, photokina occurred whilst I was away. The difference being that then I was updating HTML via a dial-up connection from motels in Oregon and Washington, whilst today I’m using a VPN to type directly on my desktop office computer, using my laptop in Cornwall just a few miles from where Marconi sent the first transatlantic radio transmission in 1901. 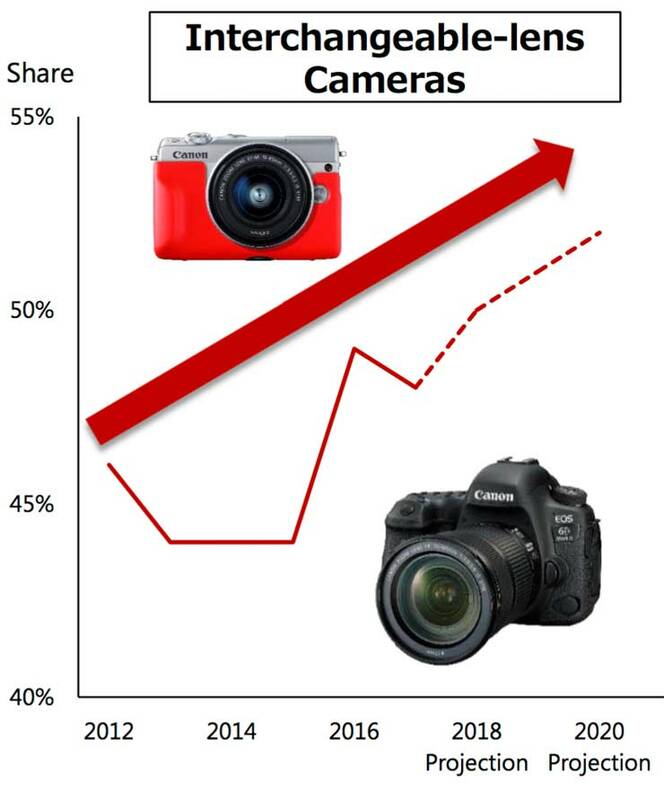 The ‘real’ camera market has surged and declined in the meantime. I remember the site getting over 200k visits on the day of the 5D mk2 announcement. Today 15k for an article/review on one day is good. I will keep the rumour pages (and archives) going although there’s never going to be the interest/activity levels of the past 15 years – just as well I always preferred to be known for the articles/reviews on the site! An appeal – If you’ve enjoyed the site over the years, please consider buying something (anything counts – even a frying pan) going via our Amazon links – it won’t cost any less I’m afraid, but with dropping the 70-200, and current family circumstances, it’s the only way I’m likely to be able to afford to replace it. 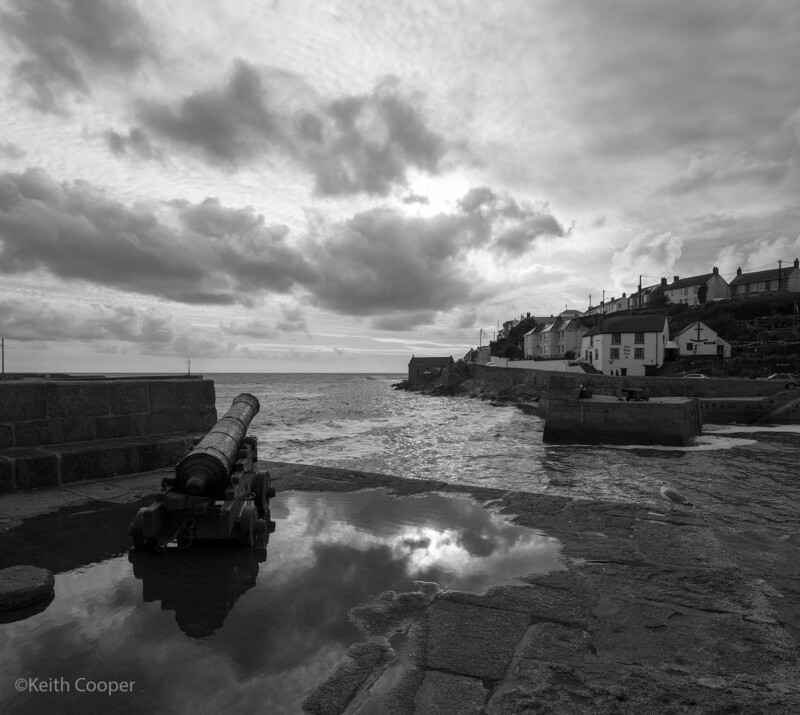 Looking out to sea from Porthleven, Cornwall. The next land in this direction is South America ~4000 miles away. 14th An update to regulatory filings [Nok] suggests we will see 80D and 7D2 replacements, and an M5 mk2 is there too. 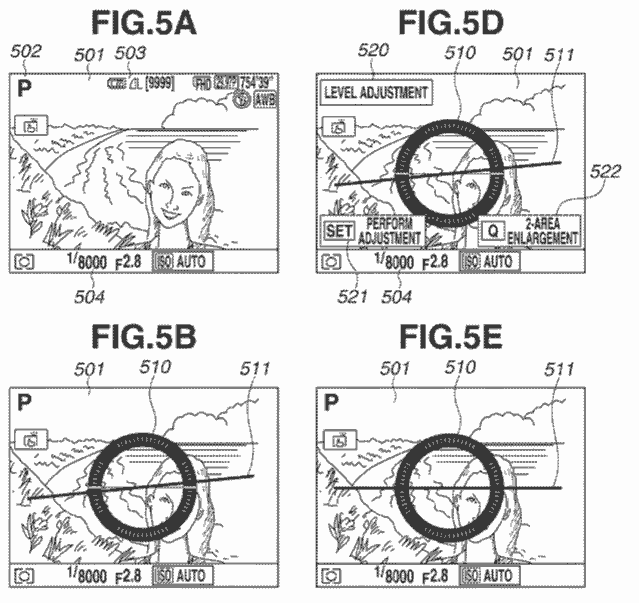 A second patent application [USPTO] looks at refinements of panning assistance when there are vibrations present and how body based sensors can work with others (such as in the lens). 4th There’s been some discussion about the potential long term changes and short term problems about Canon’s RF mount and what it means for the EF-M system (oh, and EF and EF-S too). 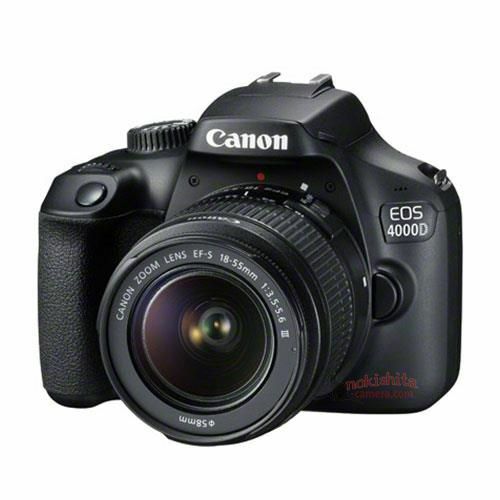 3rd Canon new small EL-100 flash is confirmed [Nok] it was listed as ds401221 in certification info. 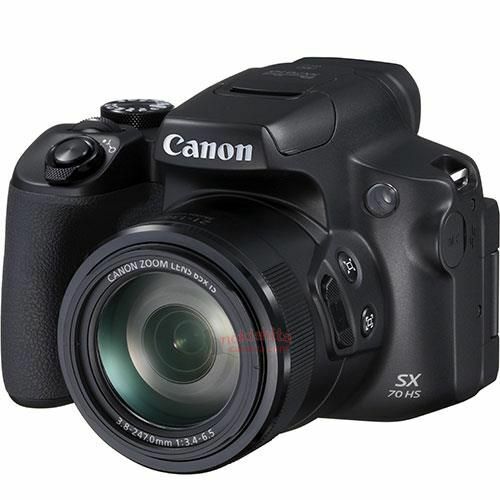 31st Enough info now to warrant s specific Canon EOS-R camera system rumour page. 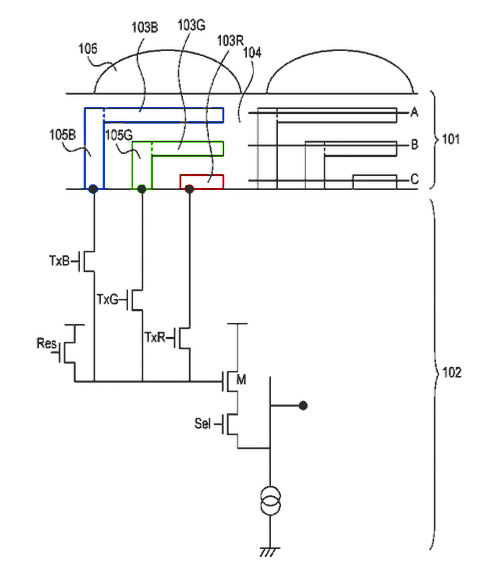 A US Canon patent application shows a pixel design that incorporates an organic (or quantum dot) photoelectric conversion layer and a silicon one below it. Advantages are that you can have your dual (or quad) photosite pixels for AF whilst extracting additional colour information for each pixel. So for example a green sensitive organic layer , would let by red and blue light for the silicon based detector below . It seems that no major announcements are on the way from Canon in the run-up too Photokina. We’ve been sent various stuff, but nothing at all with that element of substance that the Nikon mirrorless rumours took on in the run up to the Z6/7 launch. Some Canon lenses will appear, but it seems that Canon is happy to let Nikon have its Z series make the running for this show. 23rd A US patent application [USPTO] looks at implementing focus stacking and the problems of matching images shot with the focus at different distances. By introducing a thin ferrite layer, electromagnetic interference between different layers in a stacked sensor design is reduced. With the sizes of current pixels it doesn’t take much to influence electrons moving around in unwanted ways. The key element of this application is addressing the problems of sealing the bonded layers from contamination, such as water ingress. It really wouldn’t take much water to get in to damage the sensor chip. I still get asked for prints from images taken on my old Canon 1Ds, which at 11MP means some careful processing is needed if someone wants a big print. Well, I’ve been testing Topaz A.I. 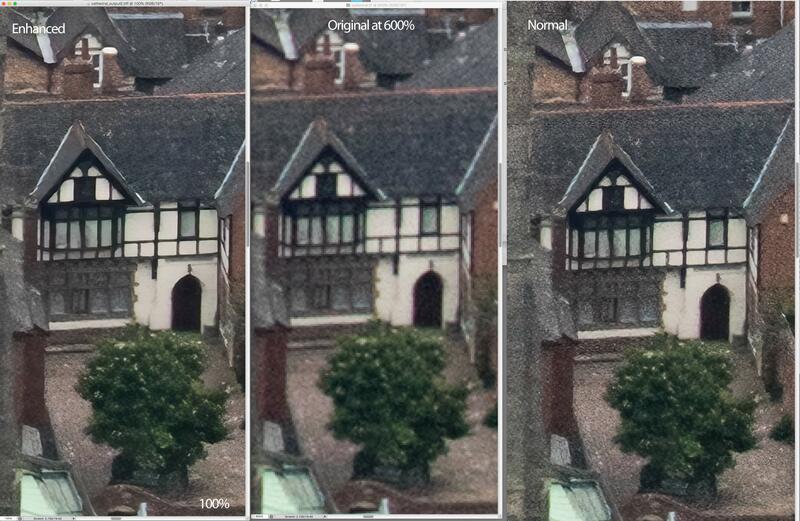 Gigapixel, a new software package with a new approach to upscaling that is rather good. 15th There is some updated model info [Nok] doing the rounds. These model numbers come from regulatory filings for wireless features. All the info comes from the Nokishita site, so any explanations you might see are mostly guesswork. It can also be quite some time between any regulatory filing and products appearing. 5th There’s been plenty of mirrorless talk of late, but Canon isn’t going to get out of the DSLR game for a long while. Whilst we’ve recently heard that the 90D will be available in November (caution – no specs, no real info either) it does leave the way for a series of high end announcements in 2019, as well as some more low end stuff to keep the range moving. 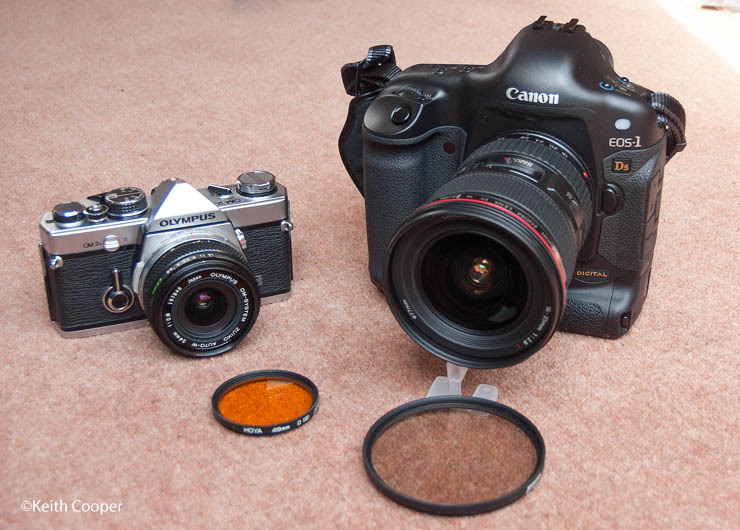 The 7D3 / 5Ds mk2 / 1D X mk3 would all be in the ‘because we can’ category for Canon. With the Olympics in 2020 in Japan, the 1D X update may be later in the year (or even Jan 2020) but all three current models are Digic 6 powered and could reasonably jump to Digic 8 (I’ll be curious to see if it makes it into the 90D). 26th Canon’s Q2 2018 results are out and they are claiming the #1 spot in mirrorless sales for the first half of 2018. 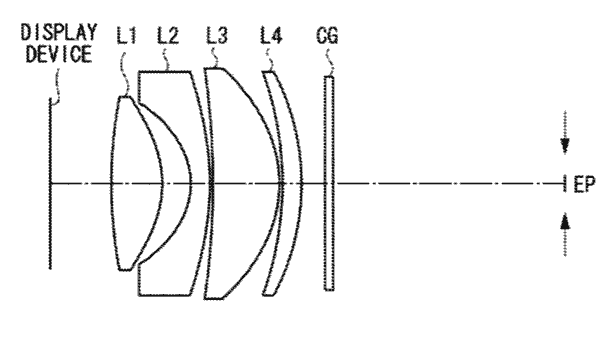 A Canon patent application [USPTO] looks at improving image stabilisation, especially for wider lenses. It includes lens IS and electronic stabilisation. I’d note that the 7D2 and 80D are made in Japan, so all you can say is that it’s one of Canon’s ‘better’ cameras. 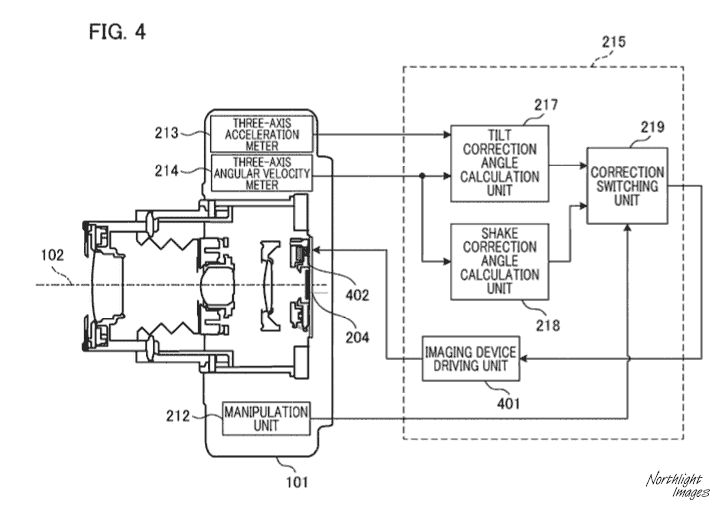 19th A Canon US patent application [USPTO] looks at how better to allow for chromatic aberration in sensor phase based AF systems. 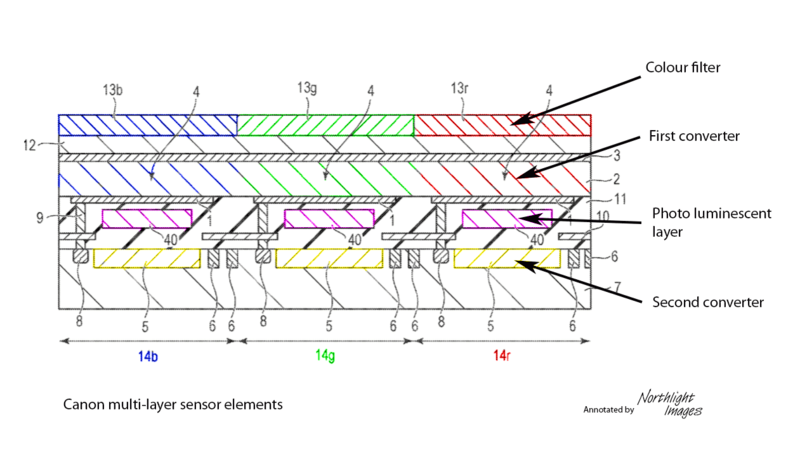 18th An interesting article about Nikon’s sensor design process [IR]. Actually at quite a detailed level and a good introduction to modern sensor design. 17th I see that Thom Hogan has been reading the Photokina tealeaves, pointing out what you might guess from the various media events just before the show [TH]. Nikon continue their clear out with KeyMission cameras moving to the discontinued bin [NR]. Sometimes searching out the rumour info just mildly irritates/depresses me and makes me wonder what to photograph? What to do when the inspiration wanders off? Whether it’s the hot UK weather (which I dislike) or time of the year, I’ve had several photographers recently mention just this to me. Anyway, I’ve written up some of my thoughts about the issue and things I do when it happens (and I don’t have the direction of a paid commercial job to nudge me). 12th A date (1st week September) is suggested [CR] for Canon’s pre-photokina announcements. 30th It’s difficult to work out details from the camera model numbers found in regulatory filings, but a recent list [Nok] gives options for all the usual suspects. 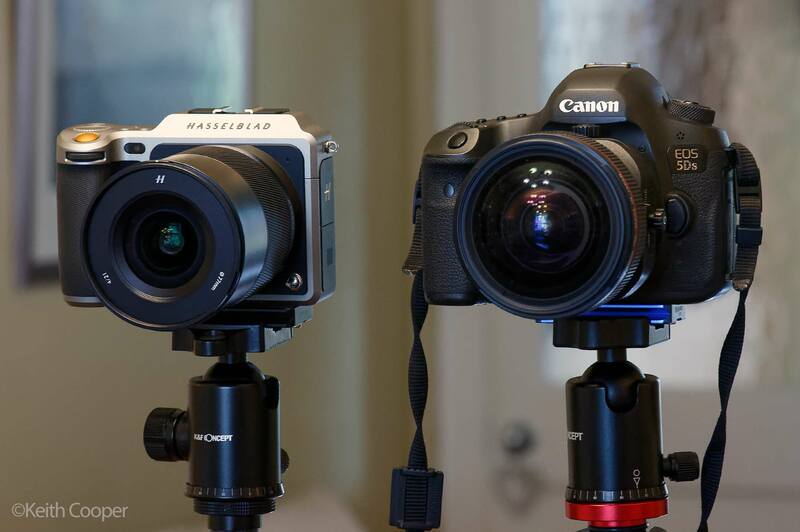 I see two FF mirrorless at the start. It’s an interesting collection of info with only a FF mirrorless and EOS M5 mk2 for this year. I’d note however that there is a surfeit of events next year, with Photokina 2019 taking place from May 8th-11th, as it becomes an annual spring show. 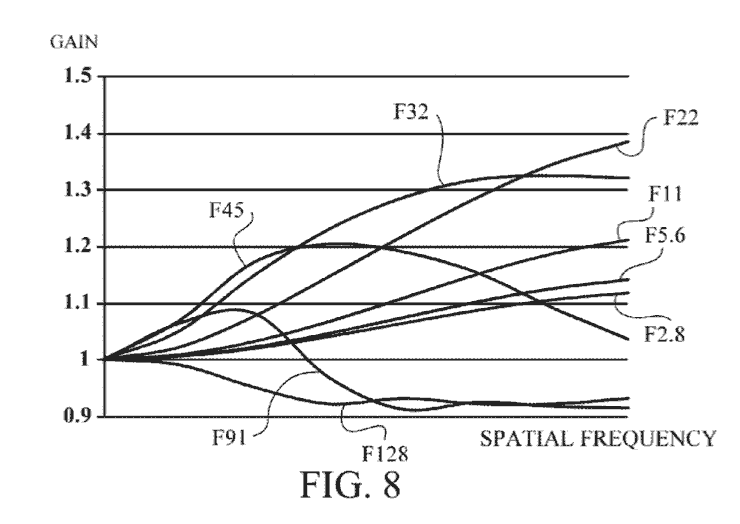 A Canon US patent application [USPTO] looks at adaptive variable tonal processing for captured scenes. 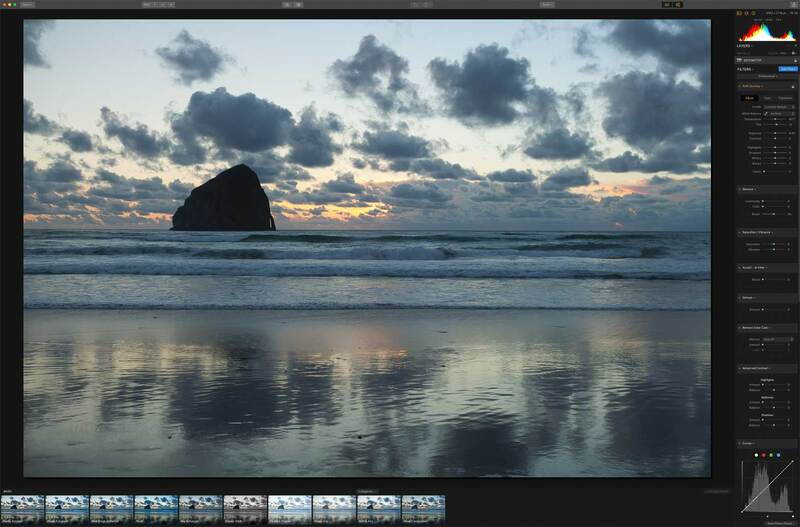 Using multiple exposures and making use of split pixel sensor options the application discusses different ways of processing scenes with the aim of better representing changes in brightness, contrast and even white balance. Just as I’ve been testing the ProGrade Digital USB 3.1 reader and 128GB SDXC card, the SD Association announced the SDXC format that takes the maximum capacity to 128TB. 24th It’s not easy to get useful info from wireless regulatory filings, but they do tend to presage new cameras by a few months, often before any real leaked info (which tends to pick up in the month or so before an announcement). This is via [Nok], so translated. 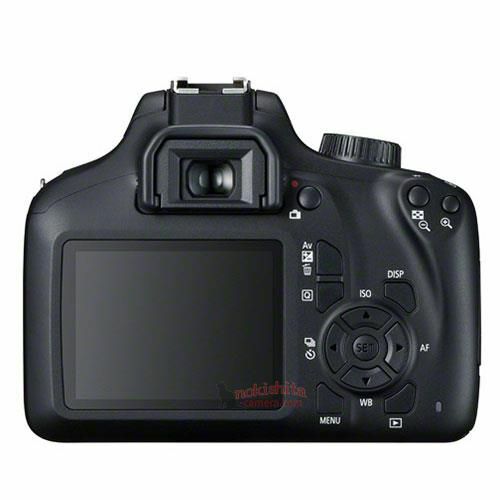 A new Canon camera ‘DS126721′ has been registered. Test numbers “K436” “K437” are DSLR, “K424” “K433” “EC 811” are mirrorless. It is suggested that K436 is an xxxD level camera (LP-E17 battery), whilst the K437 is xD or xxD (LP-E6N battery). So, some cameras are coming… Obviously the 7D2 and 80D are getting on, whilst the 77D/800D would be due an iteration by the end of the year. See the Canon timeline below for more. 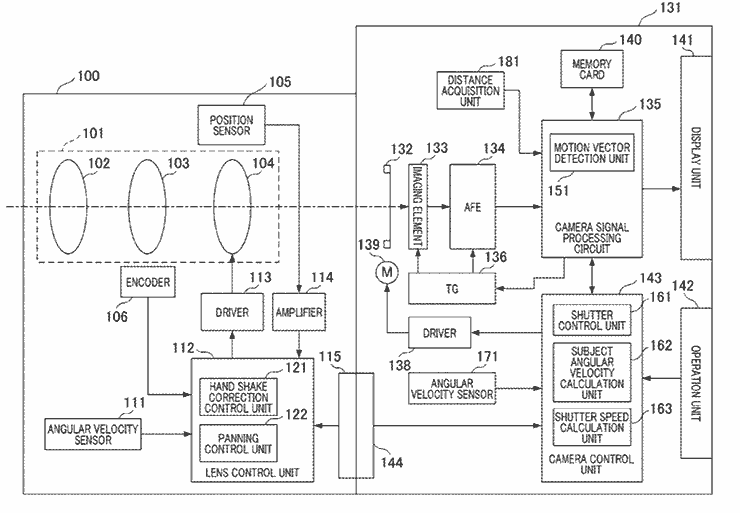 Improvements to timelapse control algorithms feature in a Canon patent application [USPTO] looking at where the length of exposure limits interval rate and other limitations. 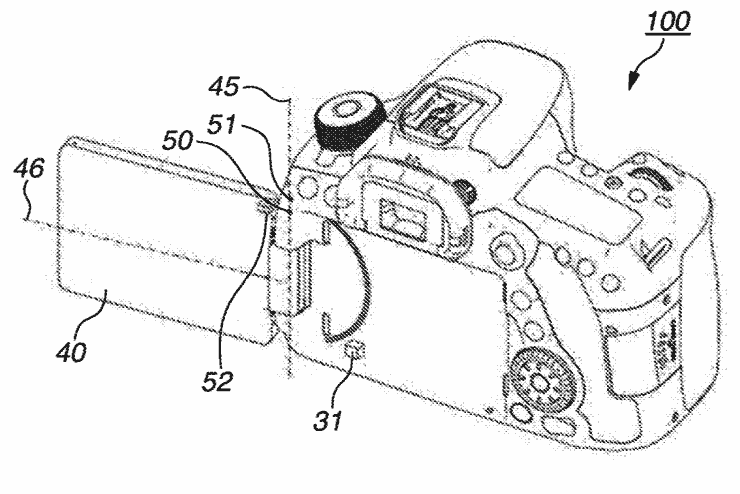 A long requested ‘feature’ for Canon DSLRs (since 2004 for myself) is ETTR metering – well this isn’t quite it, but a Canon US patent application [USPTO] looks at dealing with halation (light spillover) from bright to dark areas, such as backlit photos of people, by dynamically altering the sensitivity of different parts of the sensor. A look at the Canon camera timeline suggests the 90D and a 7D3 some time. Better video and ‘better specs’ are suggested [CR] as part of Canon’s desire to start ‘taking the lead’ a bit more, with respect to competitors. Review: Canon TS-E90mm F2.8L Macro (includes some comparisons with my old TS-E90). The Canon EOS 1V is officially discontinued [Canon] but service support will run until 2025 (subject to parts availability). 22nd An interesting set of presentations from Sony at an Investor Relations event show their (public) image sensor business strategy. 19th Can’t wait for more megapixels? Canon will sell you their 120MP APS-H sensor if you feel like making your own camera [P1]. You can even go for the monochrome version of the chip. 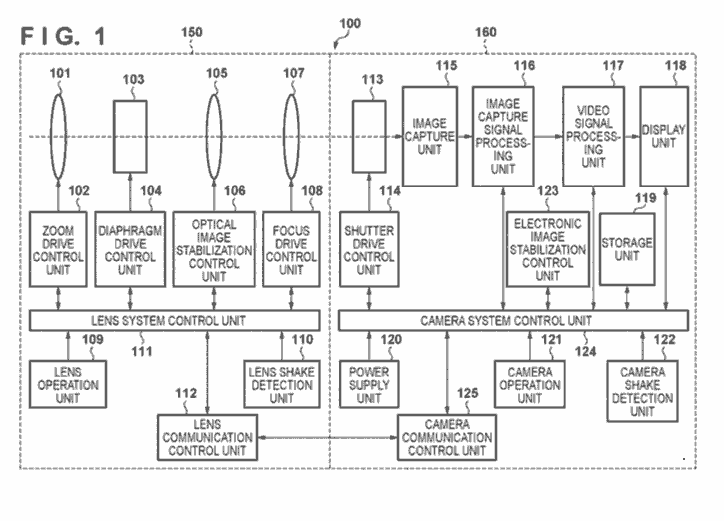 In-camera time lapse control is discussed in a Canon patent application [USPTO], that looks at minimising power usage. 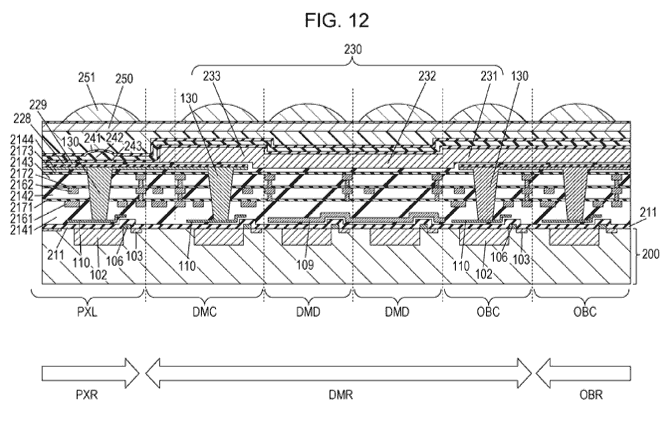 10th A Canon patent application [USPTO] looks at the use of light tubes in pixel design, along with optically opaque shielding elements that reduce noise from extraneous light. 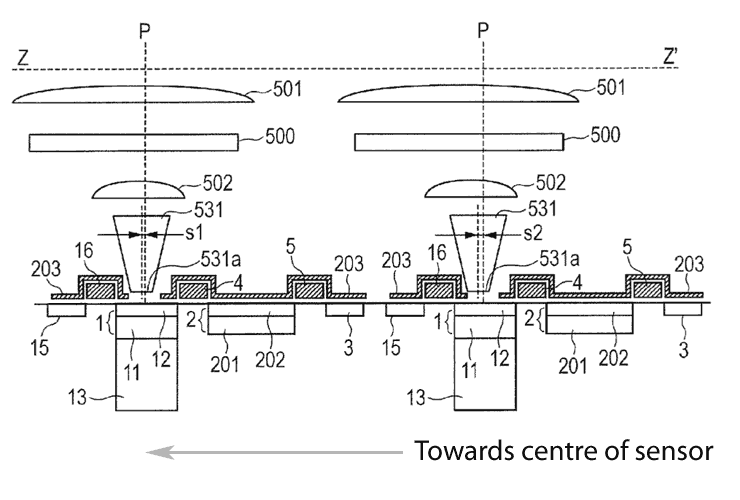 The example also shows offset pixel optics (microlenses), allowing for better light collection towards the edge of the sensor. 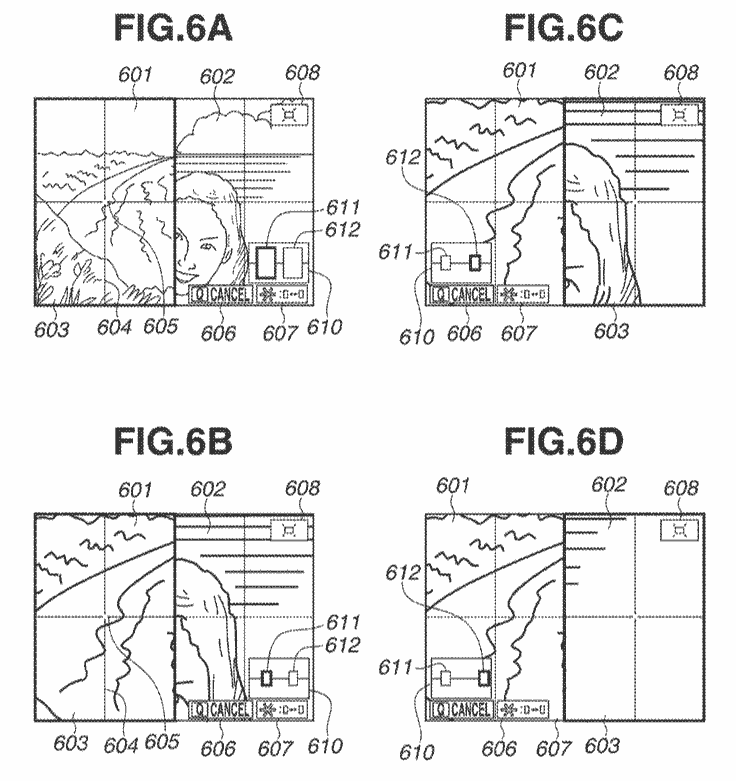 Note that like with many patent applications, a lot is left out, so these could be split pixels or more. 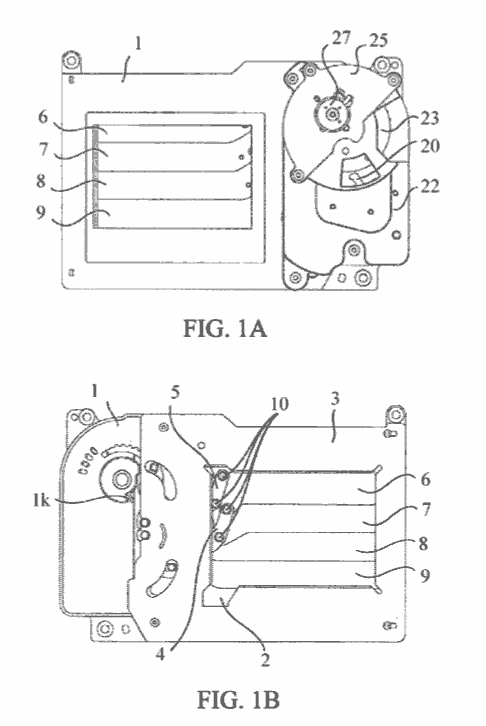 The patent also expands on previous global shutter related ones. 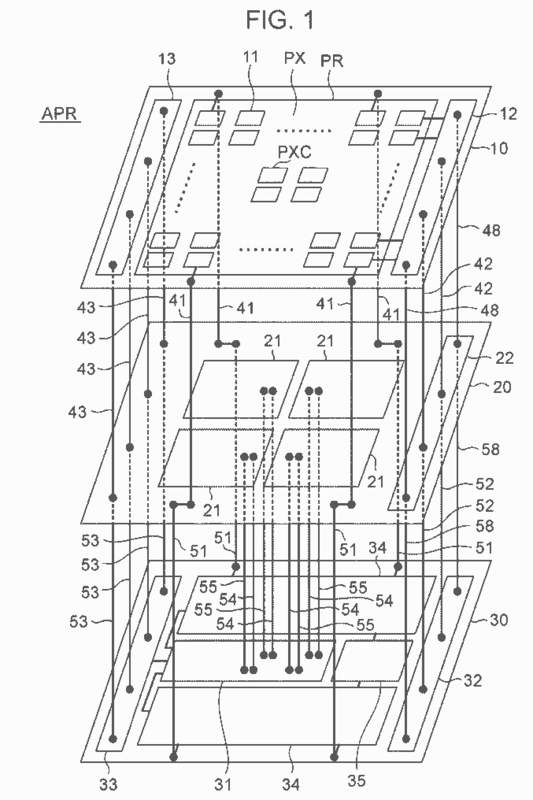 A much more practical sensor design patent application [USPTO] discusses stacked sensor construction and details of making connections to such devices. Once again, just a few specific areas of design. If you’re browsing this stuff, then do look at the prior work mentioned and the preamble to the description. 5th More suggestions (without detail of course) that we’re getting ‘something big’ from Canon for Photokina. Meanwhile, I’ve been trying to answer some of the questions I get from people wanting to ‘turn pro’ in photography. Can you start your photography business? 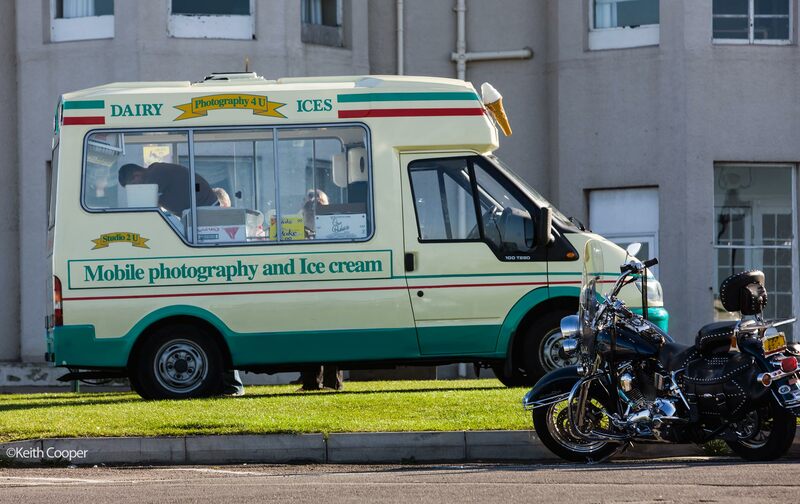 Is Ice Cream and Photography a good business plan? 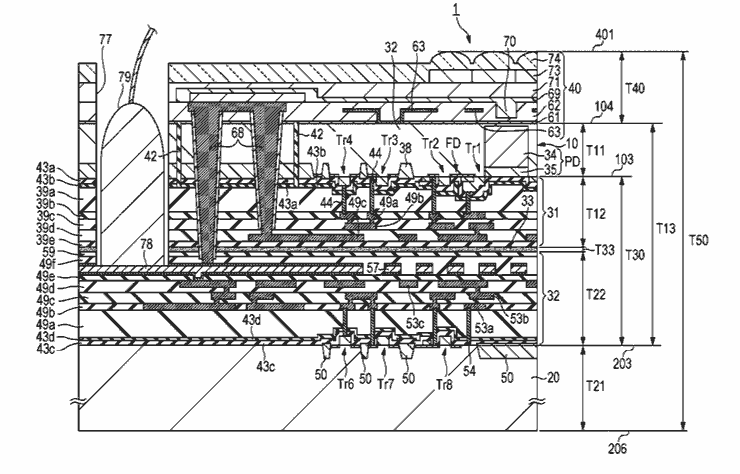 3rd A Canon sensor patent application [USPTO] looks at aspects of stable black levels, opaque layers, light pipes and a global shutter function in a sensor. Included for the sensor design aficionados. 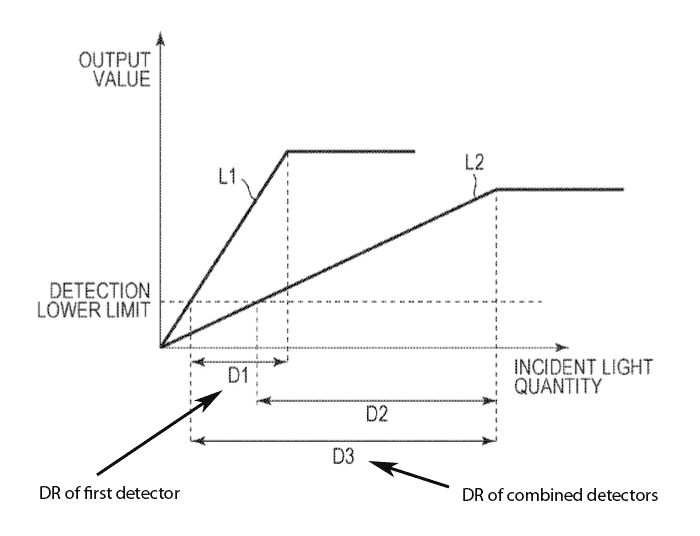 Remember that all kinds of features get patented – even if not used in a production sensor. 29th Canon has updated their DPP and EOS utility software. Details on our Canon software install page. 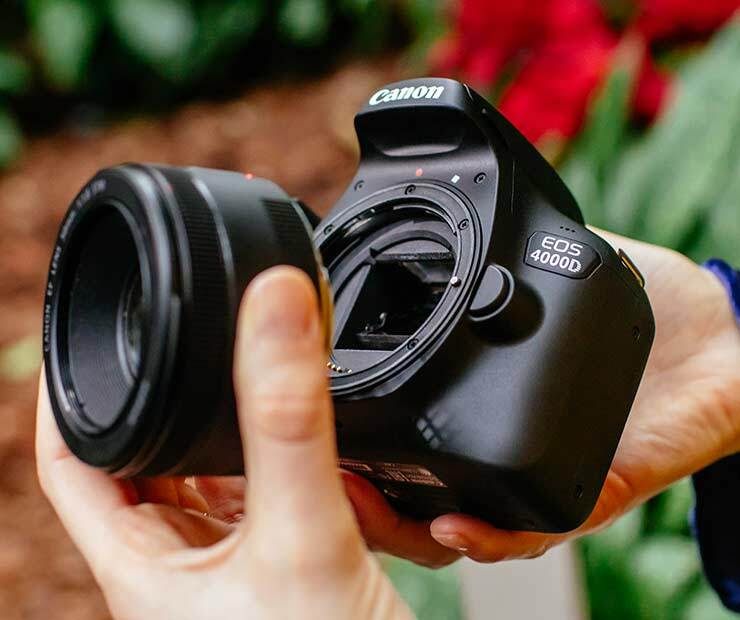 The EOS D30 featured a 3MP CMOS sensor (at $3k) – see the review at DPR for what we thought of cameras like this at the time. If you want to go back even further the ($15k) Kodak/Canon DCS520 is now supported. “There are just so many features in this camera I’m sure I’ve not done it complete justice in this review, I could write a book on what you can do with this camera, anyone who knows what you can do with a quality SLR will realise what you get when you combine one of the best SLR’s (Canon EOS-1n) with the CCD, electronics and photography experience of Kodak. True pedigree. Kodak go on, producing the highest quality digital camera in the world, trying to ignore the price this camera not only produces but is a work of art. 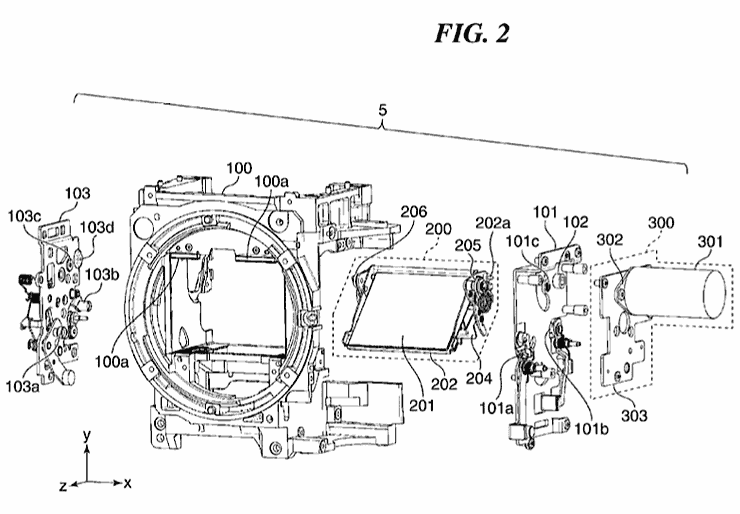 There’s a Canon mirrorless lens adapter patent application – see the mirrorless page for info. 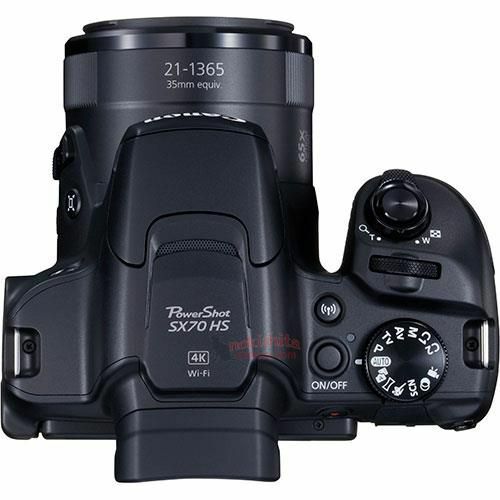 The idea is to use the IS system to compensate for panning errors as well as camera shake. This needs movement vectors calculating for the whole image area. 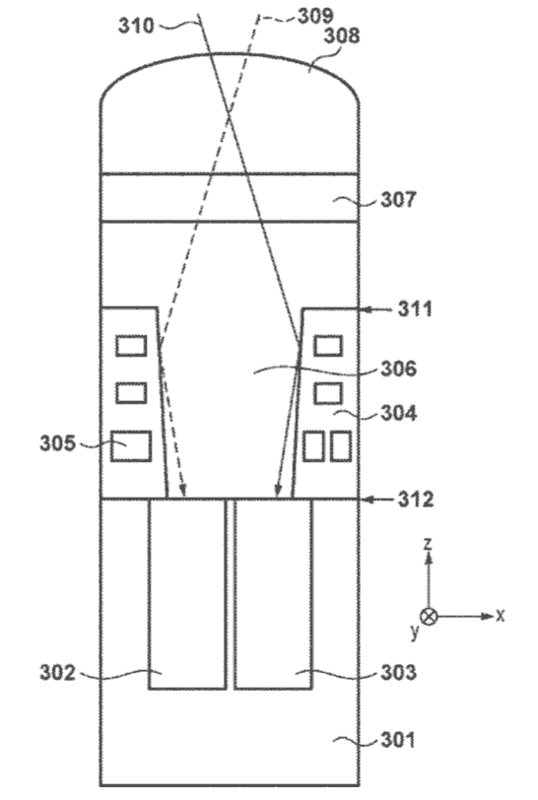 A new Canon patent application [USPTO] expands on flicker detection and ways of compensating for it. As part of my testing the new ‘Jupiter release’ of Luminar yesterday, I picked out some of my old Canon 1Ds Raw files to try. Some of my shots of a sunset at Cape Kiwanda on the Oregon coast have long been one of my critical rests for how RAW converters handle noise and blown highlights. The good news for Luminar users is that the new version is much faster and does a really good job with basic conversions. However I also tested the images with DxO PhotoLab and ACR (I still use CS6 so that’s the newest I have). DxO is now the slowest to open – an effect only really noticeable with my 50MP 5Ds files. However, in terms of image quality it still gets my vote as the image processor of choice when making large single prints (where workflow efficiency is pretty irrelevant). 10th Suggestions that Canon won’t be at Photokina in September [CR]. Given that PK switches from September every other year to every May for 2019, it does make you wonder how PK will weather the change. I know that Canon’s business units (and everyone else in the industry I’ve talked to) are facing much greater ‘value for money’ pressures on attending trade events. They just are not so important as they once were. 9th Whilst noting the rather thin flow of rumours of late, I recalled a post I’d made back in the heyday of rumours, about ‘Rumour Post Bingo‘ or how new camera rumours used to be received on the forums. An announcement [Fuji] confirms that Neopan Acros and a load of B&W papers are on their way out. The 5×4 and 8×10 versions of Neopan 100 Acros were already listed as discontinued from May 2018. 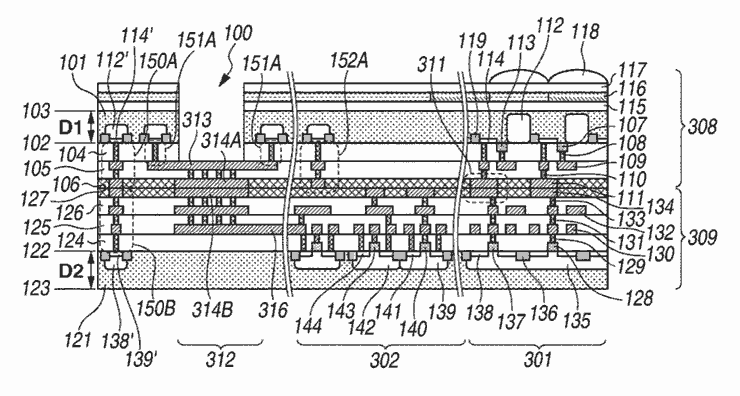 Canon Japan have a patent application [CN] showing that we’re likely to see stacked chip sensor designs much more widely in future high performance sensors. 3rd A quick look [DPR] at Canon’s new .CR3 raw format (in the M50) shows that until you start pushing things, it’s very difficult to spot differences between the lossless compressed (as you get with current .CR2 files)and lossy compressed full resolution files. As ever, take such figures for interest only. They are very prone to distortions from inventory dumping and new model releases, but I did note the continuing fall in compact cameras. 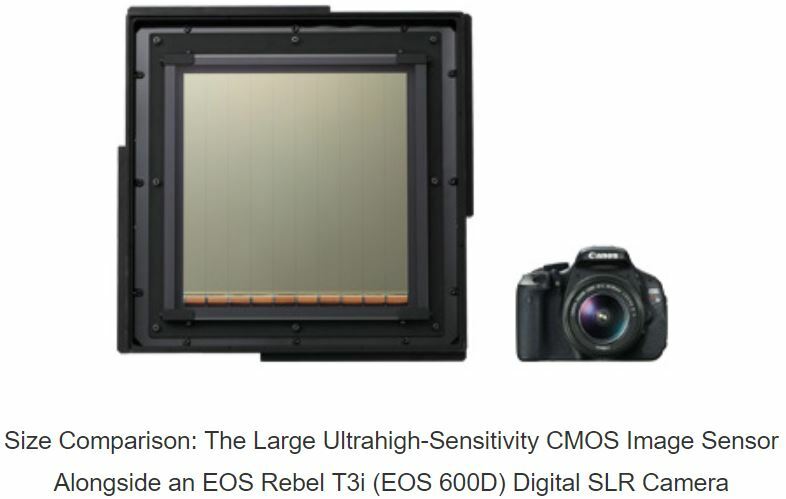 For similar info about the 5MP global shutter CMOS sensor and HD video 19um pixel sensor, see the Canon showcase page. 29th Video samples with Canon’s 120MP APS-H sensor. CERN have published a rather interesting overview (58 page PDF) covering recent progress in image sensor design. One camera I was interested to look at was the Sony A7R III. partly to get a ‘feel’ for it and partly to see how much EVFs have come on. Unfortunately someone had set this one to a sepia look with focus peaking turned on. Rather than mess with a camera I don’t know, I asked one of Sony’s experts to revert the VF to ‘normal’ mode. No more than a very quick personal observation (and my eyesight is distinctly prone to seeing flicker) but enough to make me wonder. 18th A CP+ show interview with Canon is published at [DPR]. What to make of these notoriously opaque publications? I note that Canon may not be averse to the idea of another big lens shake-up like the FD->EF change in the 1980s but pointedly mention the legacy of the EF mount. I also note their mention of the Olympics in 2020 and having something ‘top-end’ available. This could suggest a mirrorless ‘pro’ camera won’t be here until late 2019 or early 2020 – I’m still, on balance, thinking it will use the EF mount. Canon’s big pro customers will not like the idea of two different mounts for their stock of cameras (although the impact of a flood of top quality EF lenses hitting the 2nd hand market would be interesting). “In 1987, the shift was from a mechanical interface to an electronic interface. That [precluded cross-compatibility]. Despite that shift, the change provided significantly more value for our customers, which is why we went ahead. If it turns out that [the introduction of mirrorless] will create a similar situation, this might be a decision that we would take [again]. But we’re not sure yet. There are of course a lot of upward trending arrows, except when they mention cost, so need to go downwards. Automation gets a mention for camera making, with Canon making its own manufacturing kit and expanding its own software development. The amount devoted to R&D looks static (so effectively a cut) with increasing sales reducing the R&D expense ratio. This is driven by an ominous phrase (to anyone who’s worked in R&D) “Improve development efficiency through selection and focus”. …Meanwhile, it’s my birthday and Canon have just sent me a TS-E 50mm F2.8L Macro to test (but only a loan). I’ll have a review in a few weeks. 8th Sigma’s CEO was interviewed for a French website Mizuwari [Google xlt] In a fairly open piece for a Japanese camera company CEO he covers quite a few topics such as the use of plastic for lens elements (poor thermal performance), curved sensors (good for phones), Foveon chips for others (it depends) and possible MF from Sigma (too expensive). 4th Hardly surprising given market conditions, but comments via Canon in Japan [NAR] confirms Canon’s intention to push harder in the mirrorless market – just usual non-committal stuff on higher end cameras though. Ever since the first EF-M lenses, there has been the question as to whether the mount would work with the larger 36x24mm ‘full frame’ sensor? It was obviously designed for APS-C, a point reinforced (~5 yrs ago) in this interview (translated) [DCW] about half way through. I’ve had it suggested several times that Canon’s full frame mirrorless would be EF mount, given their desire to make for a clear transition for their higher end market with a large investment in Canon glass. One driver for this was the avoidance of adapters. 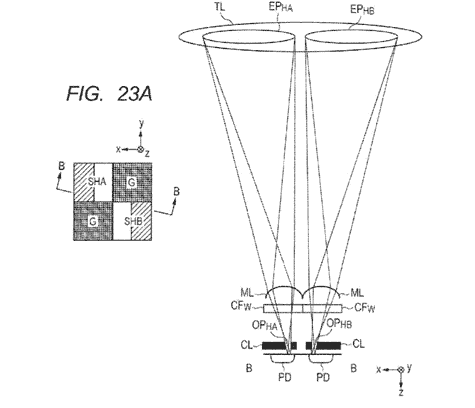 1st If you wanted to know more about lens aberration correction, a new Canon patent application [USPTO] goes into it in the sort of detail you appreciate if stuck at work watching the clock. It makes me a bit more interested in what Canon will do for full frame – Nikon? any mirrorless plans?? 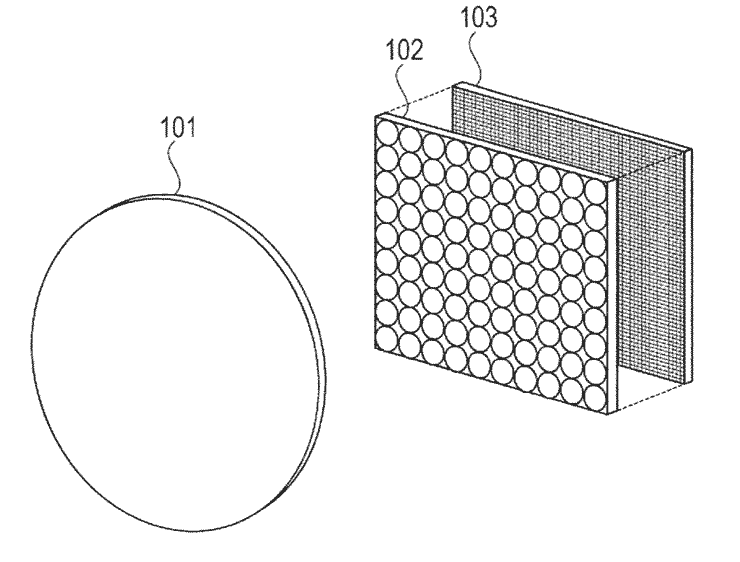 The filters are a sandwich structure with transparent electrodes. One of the issues is that the spectral transmission is rarely even – this is covered in the patent looking at the chemical involved in the lectrochromic element. 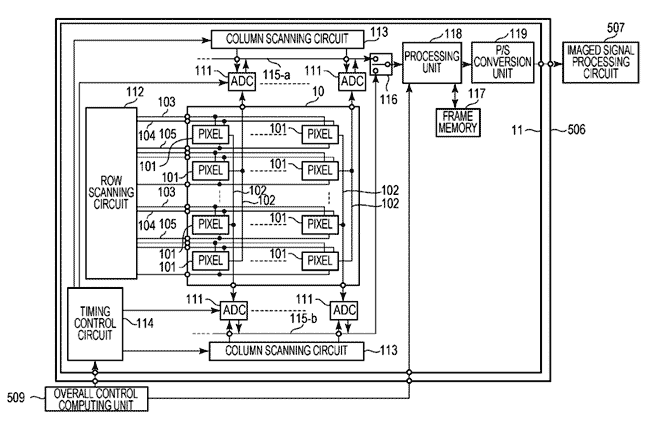 A Nikon patent application looks at multiple sequential reads from pixels as needed to allow for higher dynamic range. 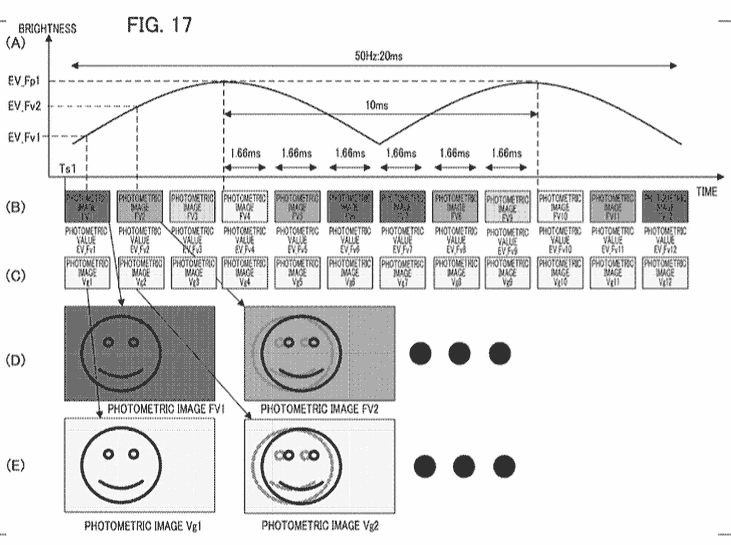 A Nikon patent application stacks pixels with differing colour sensitivities. Whilst concentrating on using pixels for AF, adding CMY and RGB sensitivities allow for improvements in efficiency and raises colour resolution. 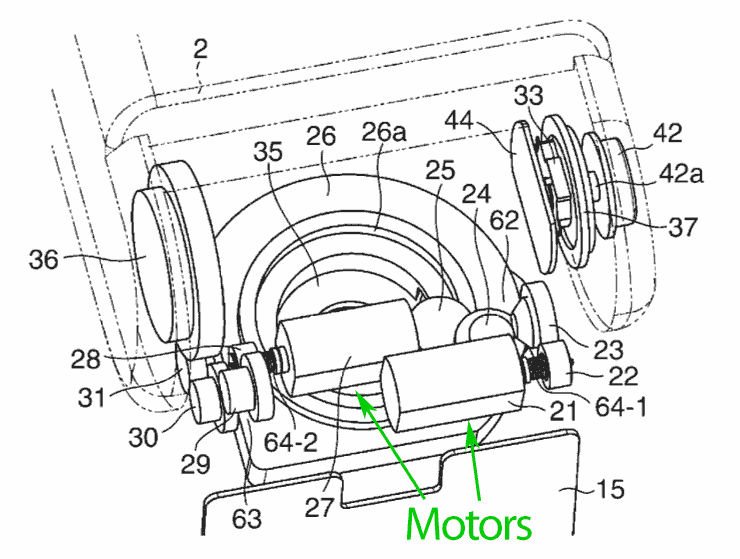 Canon shutter design is covered in a US patent application, looking at how a motorised mechanism opens and closes the shutter blades. 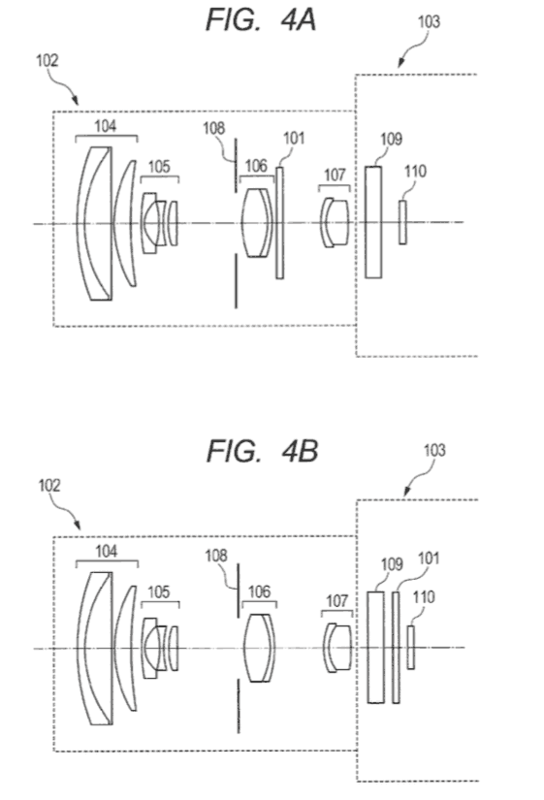 The patent goes into considerable mechanical detail – enough to suggest this is likely close to what we’ll see in actual cameras. A quick look at the timeline makes me wonder where the M50 fits – I’m inclined to think another row between M5 and M6? 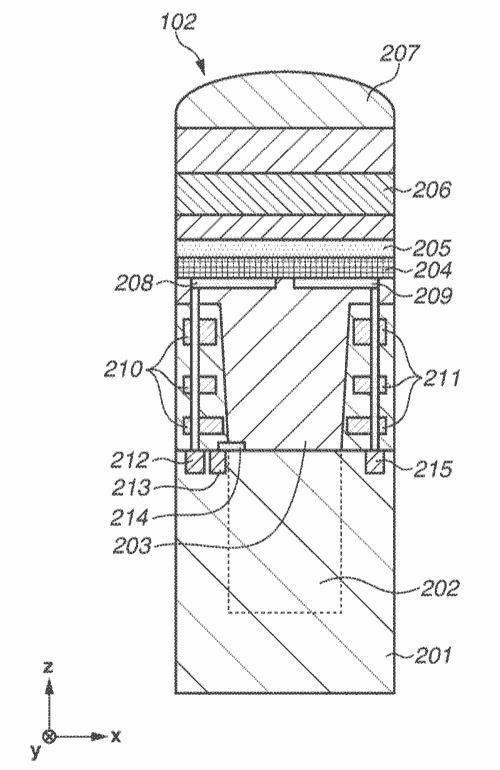 15th Dual/split pixel sensor design is covered in a US patent application [USPTO], looking at the manufacturing aspects of the sensor. There are a number of interesting elements to this, such as differing sizes of the sub pixels to allow for sensor light fall off towards the edge of sensors. One to read if you didn’t realise just how many steps are involved in making a sensor (or any modern semiconductor component for that matter). 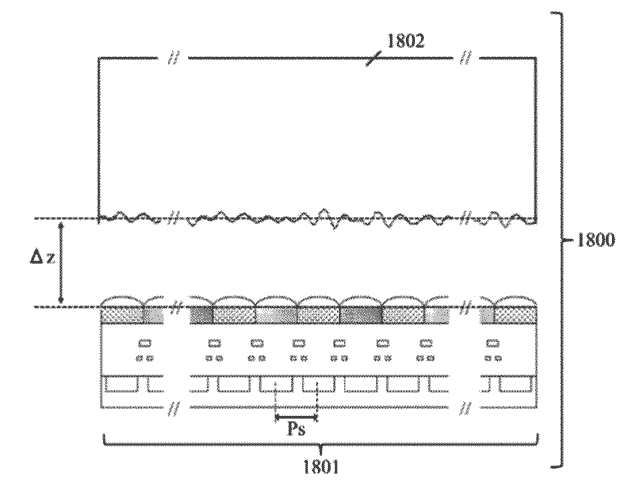 Improving the amount of light reaching the photosensitive part of a sensor pixel is addressed in a US patent app looking at manufacturing processes [USPTO]. Not as complex as the previous example. The new technology has the following advantages. 8K resolution, 60fps frame rate, 450k saturation electrons and global shutter function are realised simultaneously. Switching between high sensitivity mode and high saturation mode is possible using gain switching function. The ND filter function can be realised steplessly by controlling the voltage applied to the OPF. This Development is based on the following technologies. “OPF CMOS image sensor design technology”, in that, the photoelectric-conversion part and the circuit part can be designed independently. “Voltage controlled sensitivity modulation technology” that can adjust the sensitivity by changing the voltage applied to the OPF. 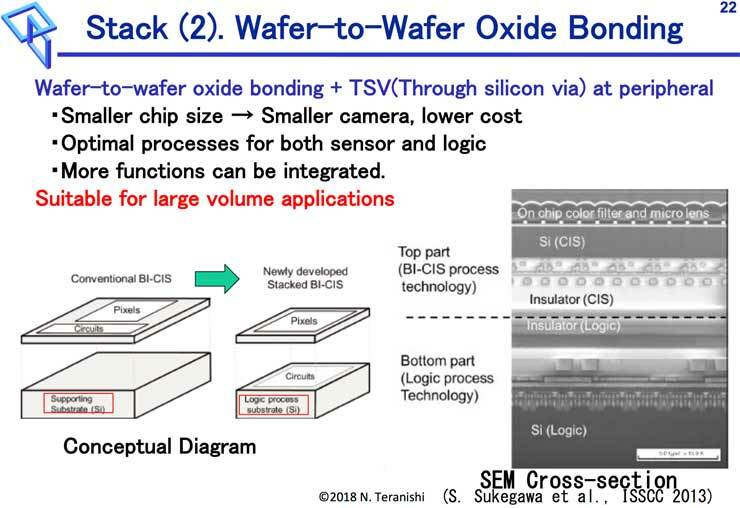 13th An interesting Sony press release [Sony] shows an actual sample sensor with two chips bonded together, where the bottom chip does the Analogue->Digital conversion all at once, giving a true global shutter. In order to curtail power consumption, the new converter uses comparators that operate with sub-threshold currents, resulting in the industry’s best-performing, low current, compact 14-bit A/D converter. This overcomes the issue of the increased demand for current due to the inclusion of nearly 1,000 times as many A/D converters in comparison with the traditional column A/D conversion method. 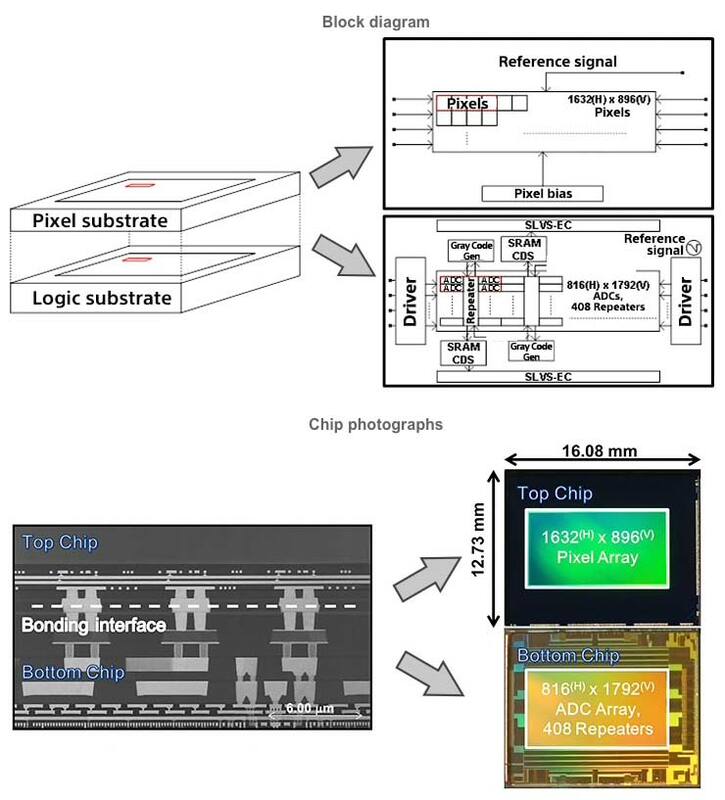 To achieve the parallel A/D conversion for all pixels, Sony has developed a technology which makes it possible to include approximately three million Cu-Cu (copper-copper) connections in one sensor. 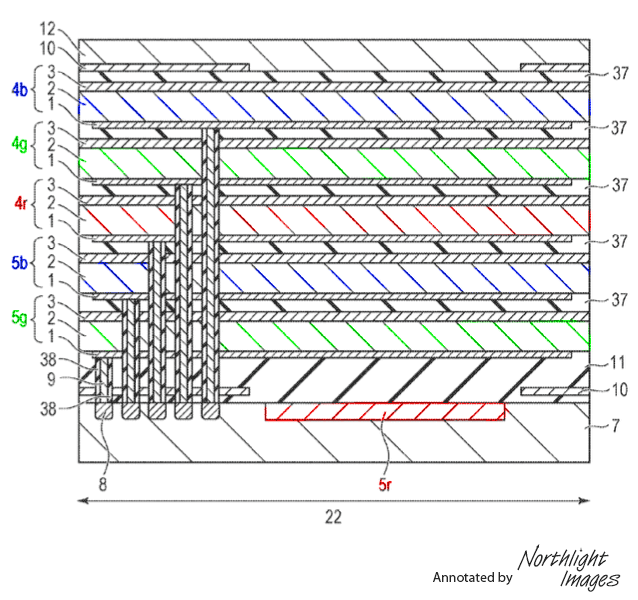 The Cu-Cu connection provides electrical continuity between the pixel and logic substrate, while securing space for implementing as many as 1.46 million A/D converters, the same number as the effective megapixels, as well as the digital memory. Sony has developed a new readout circuit to support the massively parallel digital signal transfer required in the A/D conversion process using 1.46 million A/D converters, making it possible to read and write all the pixel signals at high speed. 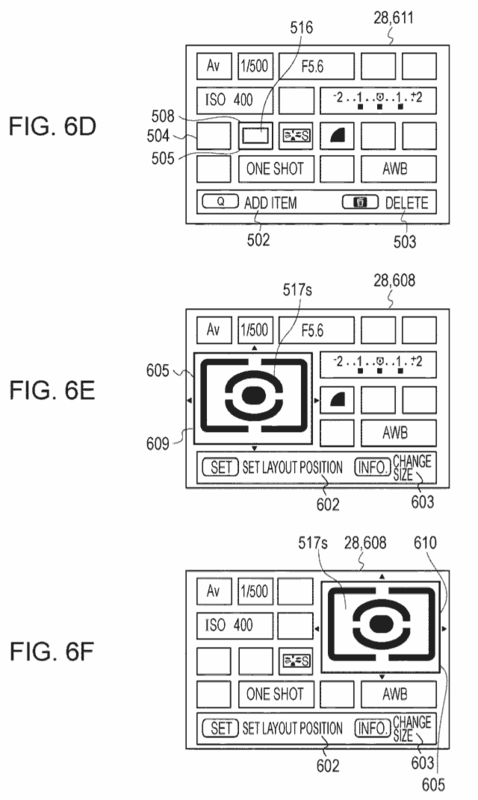 I’ve seen Canon patents looking at this too, so it’s pretty certain we’ll eventually see products featuring this. 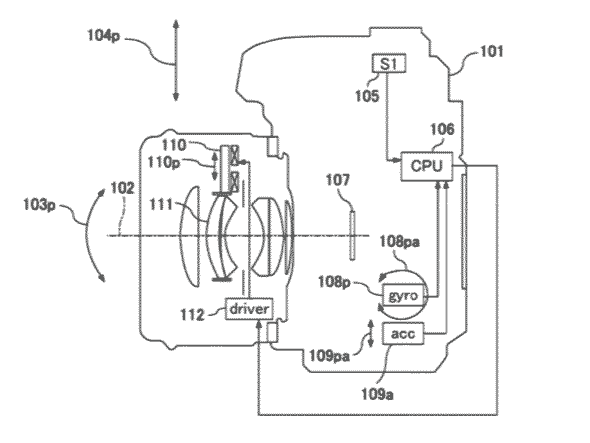 10th A lens based IS patent application [USPTO] includes stabilisation for macro. Note the movement sensors inside the camera. Such surfaces can be used for focusing screens, and in the example below. 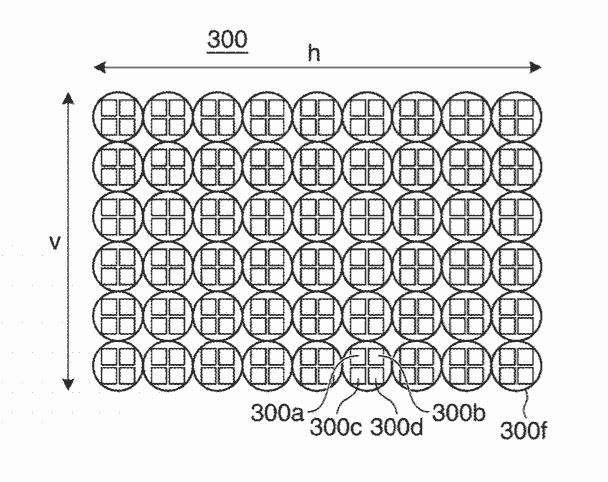 a diffuser with very specific properties for a type of anti-aliasing (AA or OLPF) filter. Despite many criticisms (rarely informed ones IMHO) OLP filters do have a place in sensor design, but conventional ones work best at high incidence angles and fixed apertures. One potential use for the ‘random roughness’ style of diffuser could be mirrorless systems which can have a much wider range of light incidence angles. 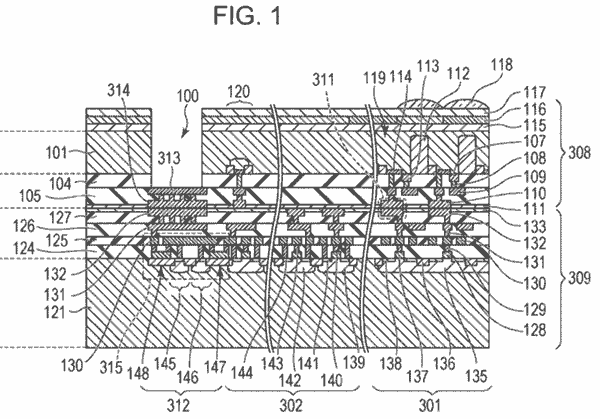 US patent for a stacked sensor [USPTO] – covers bonding and interconnecting layers. 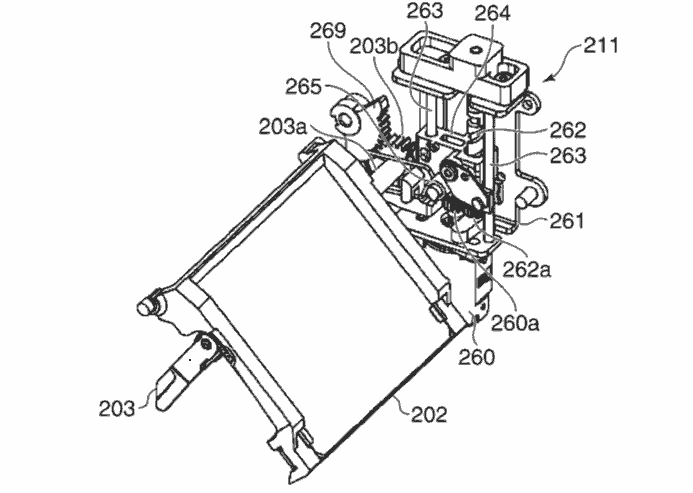 For those of a mechanical bent, a new Canon patent application [USPTO] for a mirror drive device for a DSLR. Faster and less bounce. These things have to be assembled. All those parts and assembly time are the main reason companies want to go mirrorless and get rid of the shutter. …but not just yet. 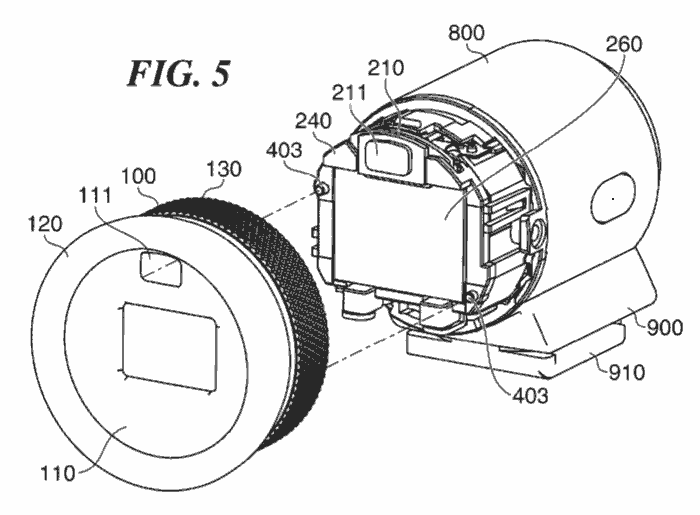 28th Today’s top patent application [USPTO] Fingerprint ID for your camera body and lenses. Lets you assign custom functions (AF/IS/lighting etc.) to different fingers and even offers multiple users and security lockout functionality. Several rumours are going round about a new shape of camera from Canon [CR] – this could be their mirrorless design or just a new camcorder. And in our ‘serious’ stuff… I just had a look at a nice LED ringlight from Kaiser. 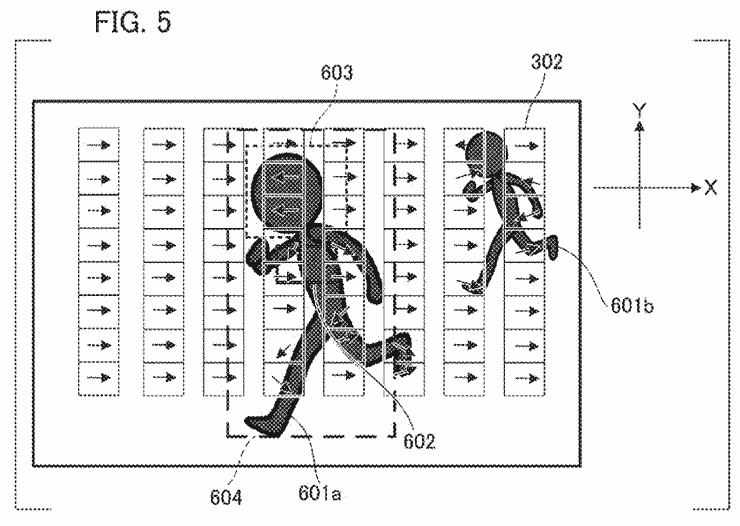 A very detailed patent application (i.e. 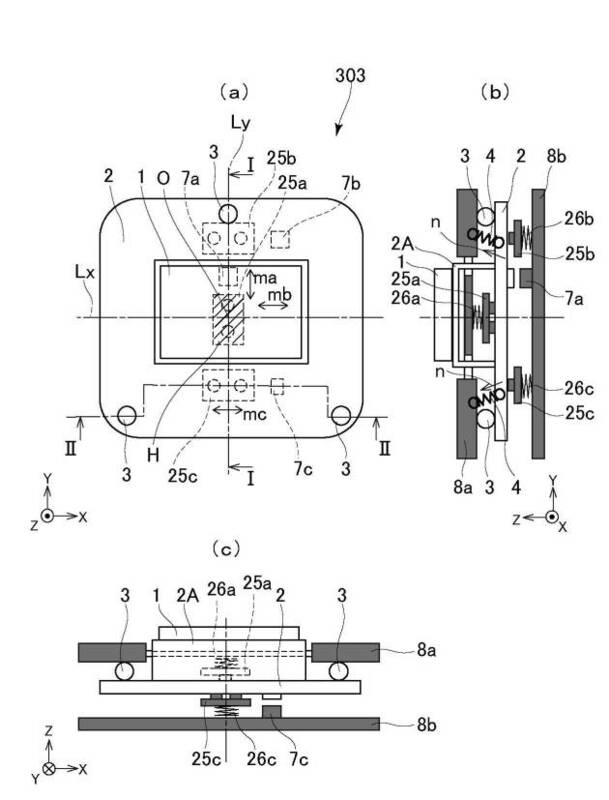 closer to being realised) in Japan [CN] shows many more details of producing a stacked sensor (see last years archived posts for many more patents). Note, in the US application below there is an option for organic compounds. Canon (and others) are putting a lot of work into this aspect of sensor design – as to when we see it in a product, that’s a different matter. In news to some photographers whinging about sensor DR, it won’t be their concerns that drive technology here, but more the need for automotive imaging to work under the same lighting conditions that our visual system does. 19th A very interesting US patent application [USPTO] for a multi level sensor pixel design the includes a photo-luminescent component. 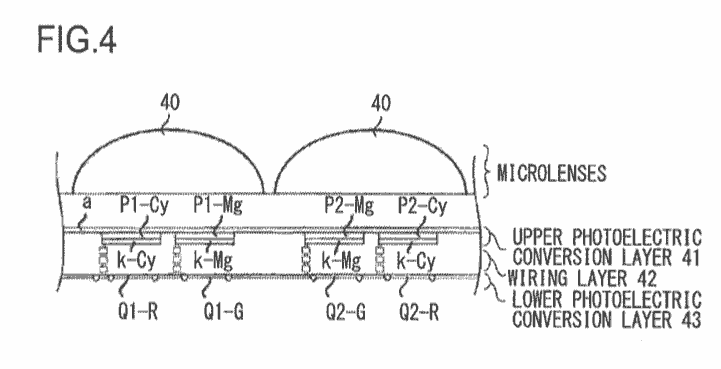 I had to read this a few times – part of a photo sensor that emits light? Light comes in through a conventional colour filter and reaches the first conversion layer, where some of it is converted to electrons. Some light goes clean through and reaches a PL (photo-luminescent) layer where some is absorbed and re-emitted (at a different colour). This re-emitted light is detected by a second conversion layer. OK, so I’ve got two output signals for each pixel – what advantage does this give? By careful choice of the compounds used (organic and inorganic) for photon detection and photon emission layers it is possible to significantly increase the dynamic range of the pixel as a whole. In the example above, the PL layer is separate, however the PL compound can be included in the photo-conversion layer itself. 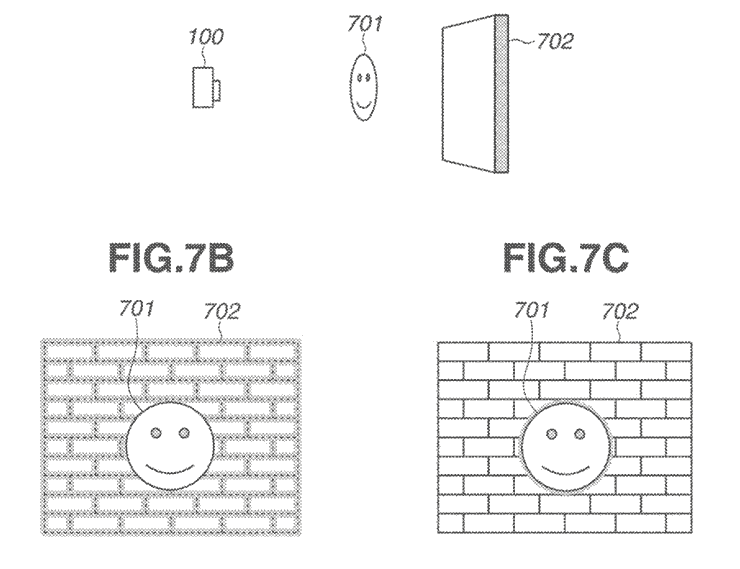 As ever, patent applications are not products, but I like the smart design of this one. 13th As an antidote to some of the more breathless fan/rumour sites, have a good read of Thom Hogan’s views [TH] of what the camera business needs. 1DX3 – definitely before the 2020 Olympics, so not 2018, with maybe an announcement late 2019, but early 2020 more likely. 5Ds mk2 – possibly 2018 if the Nikon/Sony are seen as a big enough threat, and Canon has the technology to produce a 5Ds2 that is ‘noticeably better’. Personally the 5Ds works an absolute treat, but I guess some people use it in more diverse situations than I do (in which case get a 5D4) I’m still more inclined to expect it early 2019. An update this year is far more likely to be one I skip. 7D mk3 – This reminds me of the continuous, ‘surely they must update it soon’ talk about the long lived 7D. 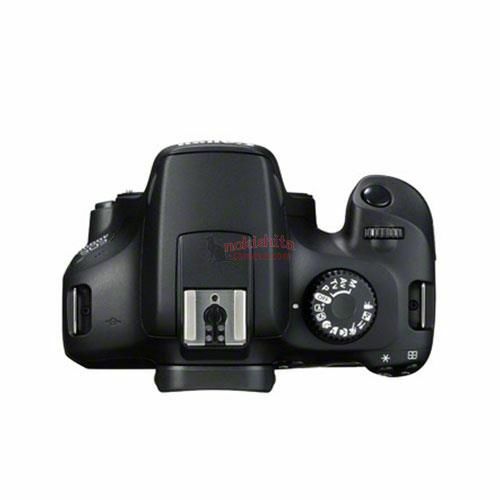 The 7D2 price is holding steady. 90D – Ok, the 80D is two years old, and prices are starting to drift down. In many ways it needs some more differentiation from the 77D. The 60D lasted three years, the 70D two. An update to Digic7 would be in order. How does this fit in with a 7D3? 12th Time for a New Year’s look at the Canon Timeline. Both 7D2 and 5Ds could last into 2019 before updates? The only reason the 1Dx2/6D2 /200D are extended through the year ar that I’m pretty certain they are not for update – that and it makes the table layout work better. 11th Something to improve the light quality of white LEDs. A new red phosphor [Nik] means we could see much better CRI LED lighting. I’ve always found the DxOMark figures interesting, but widely mis-interpreted. This is one of the reasons my own reviews are rarely quantitative. Lots of figures and measurements make for glib inaccurate conclusions without lengthy background explanations of what the numbers signify. Given many readers just want the quick numbers, you can see the potential conflicts. See why I never recommend the best for more on this. Q: What is the biggest issue currently facing Canon? A: Our primary management goal this year is to raise our antennas high toward cutting-edge technology. It is on this point where we lag behind other companies. We will open up a research and development center in the U.S.’s Silicon Valley, where we will actively adopt new technology. Q: What do you believe is imperative for today’s corporation? A: To read the trends of an era. Innovation is steadily advancing, and it has become difficult to put out products that are ahead of the competition, even if by just a little. This is now an era when latecomer manufacturers stand to gain. Compared with the past, even I feel mounting tensions. 2nd Making a sensor with millions of pixels – how do they fail? [Aph] A quick guide to many of the forms of dead (or just very poorly) pixels. 1st Happy New Year to anyone visiting! Whilst we have the consumer CES show coming up soon (CES Jan 9-12), the Japanese CP+ show isn’t until the start of March this year. Older information, rumours and patents are on the 2017 Archive page – our archives go back to 2004.